The talk about a work stoppage in the future is very scary. It could really kill the golden goose for both sides. The last one damaged the sport and was only revived by a PED fueled HR race. There wont be one of those this time. I definitely agree that players need to be given more of the revenue. And minor leaguers need a living wage.. but if there is one thing Americans hate, its millionaires and billionaires fighting about money. Many analysts already say Millenials and the generation after them (gen Z is it?) dont care much about baseball already, a long work stoppage could kill baseball with them the rest of the way. All good suggestions and I would add eliminating the service time manipulation that currently exists. If there is going to be a hard cap, it should be based on a percentage of revenues as opposed to a fixed number. That way ownership and players are aligned in the growth of revenues in the sport and/or in any decline of revenues. Interesting to follow the Kyler Murray situation in this context too. Not sure how this wouldn't be a lawsuit if they do that. By the MLBPA on the one hand and by everyone in Murray's draft year on the other. This is pretty fascinating. Unless other players had a similar kind of opportunity that Murray has with the NFL, I don't see how they/their agents could have an issue with whatever kind of agreement the A's strike with Murray. Murray's situation is clearly unique. I don't see how this is against any rules. And of course putting Murray on the 40 uses a roster slot in addition to whatever money he gets. So there is a significant cost. Probably worth it for the A's though. He is a college player so he could advance pretty quickly through the system. In 2017 he was terrible but in 2018 he was very good (954 OPS) at Oklahoma. Suggests some aptitude for baseball if he ever applied himself to it. It's not real clear how this would all actually work but I think the issue is less the unique opportunity than the fact that he will be a second-year player and can basically walk away w/o the A's getting a draft pick back (though he'd have to give back the money). Still, it could have ramifications for Ohtani and it's a bad look for the slotting system and low minor league salaries in general. Will just be more fodder heading into 2021. It's not unlike signing Kingery in some ways I suppose, except ironically the Phillies seemingly wouldn't dream of sending Kingery back to the minor leagues. MLB’s position is the #Athletics would be permitted to select Kyler Murray to their 40-man roster and sign him to a major league deal because the team did not contemplate or discuss such a possibility as an inducement when it originally signed him of the draft. Still strikes me as problematic going forward. OK, so it's bad for the slotting system. Should we care? Should we care what bonuses are paid to amateurs to get them to sign long-term contracts? (Keeping in mind the the Uniform Player Contract binds signees for seven years). Do we like the slotting system? If so, why? Or are we just afraid of change? There's a certain appeal to the concept of allowing clubs to pay whatever they want to induce amateurs to sign, with the stipulation that above a certain level, said amateurs must be added to the club's 40-man roster. This would automatically limit the number of player who could be so treated - and the penalties for "getting it wrong" would be significant, as such players have three option years, and then must stick on a 25-man roster or be waived...and in the meantime, they would tie up a roster spot, which would increase opportunities for other players to move among organizations. Bottom line here is that the A's won't pay Murray mega-bucks unless they think he's worth mega-bucks... and if he's worth mega-bucks to the A's, why shouldn't he get mega-bucks? If your answer is because "it's obscene" (which IMHO really means because "he shouldn't get so much more than I could get"), you're not going to win many arguments. If your answer is because it would damage the draft's ability to hold down signing bonuses... well, then you're acknowledging that the draft exists to hold down bonuses; e.g., to prevent the free market from paying top amateurs what they're worth to the industry. You're welcome to that position - but not to pretend that it's anything but supporting a monopolistic practice by a cartel to keep down the cost of purchasing talent. If you're concerned about competitiveness... keep in mind that we're talking about the Oakland A's here - not one of MLB's "moneyed" franchises, but one that is notoriously frugal (in the context of MLB franchises). It's funny. Some of you would call me a socialist (some here have); certainly a "progressive" or a "liberal." But what I'm saying here is, "Let the market work." The status quo here isn't the free market; it's monopoly power. But what happens, IMHO, is that self-interest gets in the road; fear that the game we love to follow will be disrupted is allowed to override (note that I did not say "trump") what we would otherwise see as right vs. wrong. It's not that important to me; it's entertainment - and the day I let entertainment get in the way of right vs. wrong... well, just take me out and shoot me. I would think Ohtani, and every other young player, would love to see Murray get additional compensation from the A's in Year "2" after signing a minor league contract in Year "1". I don't really see Year 2 as being the issue - the only reason this is an issue is because Murray now has an opportunity to play in the NFL and get significantly higher compensation if he is a high NFL draft pick. Is there another player in the major leagues or minor leagues that is in a similar position? Cord Sanberg was a 3rd round pick for the Phillies in 2013, signed for $775,000 and retired last year to play college football as a QB at Auburn. If he had a chance to do it over, maybe he would have been better off going to college first, playing both football and baseball. But $775,000, plus a MLB scholarship as a back up, is a lot of money for a young player to turn down. Tough decision. Can't wait to see how creative the A's get with a proposal and whether it convinces Murray to stick with baseball. Bill Baer did a good job summarizing this I think (similar to Julio's thinking. What I find "problematic" is the system is still unfair for everyone else, and needs to change, not that it needs to be preserved. As should already be clear by my other posts in this thread). MLB will reportedly allow the Athletics to negotiate a new contract with 2018 first round draft pick Kyler Murray, who is mulling entering the NFL draft. As ESPN’s Keith Law notes, that would mean the A’s would run out of minor league options on Murray after the 2022 season. In other words, it speeds up the timeline for Murray to become a free agent, getting to his maximum earning potential in the majors much sooner. I don't like it. All draftees and all teams should play by the same rules and the rules shouldn't change after draft day for your class. How much a draftee in the baseball draft can earn should not be a function ow whether or not said draftee might also be drafted by the NFL or NBA. I don't think this can change or improve the draft or the bonuses draftees can earn. We've been here before. The Phillies own Travis Lee got $10 million many years ago when he was declared a free agent. It is not a secret to anybody that if anyone could sign the top draftees in an open auction market, with no cap on how many total $ a team could spend on draftees, that at least some draftees would get at least $20 mill. More recently than Travis Lee, we've seen the same thing with Cubans and Japanese signees. I don't feel all that bad for the top draftees. Under the current system, including arb and 7 years of team control, I feel bad for the guys who make it to the majors, especially the guys like Ryan Howard and Rhys Hoskins, who never got a big signing bonus and put up big numbers in the big leagues for not all that much. There are way too many guys like LGJ who get millions and never become anything, and in the case of LGJ never seemed to really try to be anything. 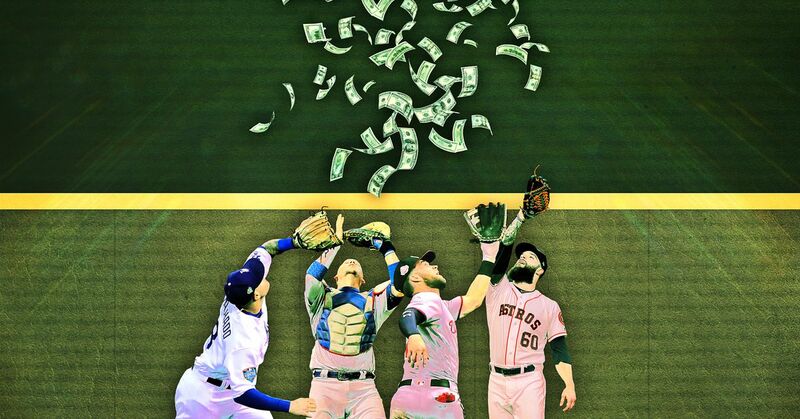 In the main, the extra $ need to go to the early-year MLB players who are producing big stats. Seranthony dindn't get a big bonus and as a pitcher could be injured and career over long before he has enough MLB service years to qualify for moderately big money in later arb years or big money as a FA. What would Nola earn tis year under a fair system? Agreed, that's the problem - there shouldn't be exceptions, and it cracks open a window to subvert the bonus structure in future drafts (say Nick Senzel had mysteriously dropped to 12th, and then his team signs him to a major league deal in Year Two. It would be obvious, but how would MLB still have the credibility to crack down?). Travis Lee and Matt White were not good situations either and of course Boras tried his best to make J.D. Drew a free agent too. I think revising "Super Two" into immediate arbitration-eligibility would be a step. Shortening the timeline to free agency would be another. For someone like Hoskins he would either get to cash in sooner or there'd be more pressure on the Phillies to get him signed. I also think if MLB was willing to do something as simple as pay all of the minor leaguers a year-round, full benefit salary (what they make in AAA now say, but for 12 months) it would be a lot easier to justify the crapshoot. I suppose if baseball was smart they'd just get out of the minor league business entirely, as hockey basically is. Draft a teenager and keep him in "junior" for four-five years and only have control over AA and AAA. The development timeline does make it hard to make an apples to apples comparison - in Kyler Murray's case, he can just go to the NFL and start playing tomorrow (or at least next season) and make a lot of money, even if he fails (or gets hurt). Choosing baseball would be more of a gamble but could also lead to a much longer, more lucrative, and less debilitating career. I think the Grandal signing was kind of dumb. Why lose a draft pick for one season of a player? It's not like the price was cheap. The talk about how much Grandal should be worth is interesting, because I think if Alfaro can walk a bit more, he can be Grandal in a couple of years. I think Machado/Harper being unsigned is a bad example of a so-called broken process. It seems their agents are deliberately slow-walking the process. Just because Harper turned down $300 million doesn't make him worth a whole lot more than that. I'd count $350 million as very much full value. The fact that Grandal turned down a QO doesn't make him worth a lot more than the QO price. I suspect that not being able to get a deal from a team he wanted to go to, he didn't want to commit more than one year on this deal and is hoping to get to one of his desired destinations next season. If you like a guy enough to give him over $18 million and also lose a draft pick, and he is only 29, the team's preference is likely a 3- or 4-year deal. Maybe this would be an opportune time for some ballsy billionaires along with some current or retired ballplayers that have already banked $100 million plus (there are more than 70 players that have signed $100 million contracts) to start a new major professional baseball league to compete with MLB, similar to what McMahon is attempting to do again with the XFL and Peter Thiel is doing with the AAF. Founding ballplayers can become owners, and good baseball coaches and players that are being eliminated from the MLB game due to age or due to analytics can create an entertaining and affordable product for fans. Start with an 8-10 team league in key US cities, employ 3 ball, 2 strike counts to shorten the game times by up to 30% thereby creating more focus, timely action and less downtime. Fans aren't going to games to see owners and analytical front office staff, they are going to watch the game of baseball and to see their favorite players and if enough good players join the new league, it could be enticing. Especially if the league can get some of the exciting younger players that aren't being paid fairly under the MLB current structure. The internet and live streaming offers a direct connection to the fans without being totally controlled by the major networks. Also, if a new league offered a fair salary to minor leaguers, I don't think it would be too difficult or time consuming to create a two or three level minor league system as there would be a lot of minor leaguers that would jump in a heartbeat to the new league. A more upscale and creative independent league is a pretty fun idea, but I don't think it would be able to exist at anywhere near a big-league level. The football leagues you mention are going to pay their players around $75K, and they both have TV contracts (baseball, nobody's clamoring to get more of that on television, except maybe after Matlock reruns). So, a great way to peel off AAAA players or unsigned over-30 veterans trying to get back, but that's about it. And with the anti-trust exemption still in force, affiliated minor leaguers would not be able break their contracts to play in it. If you really had the big money of course you could sign a few big-name free agents and first-round caliber college players but I'm not sure that would really sustain. I live in a city (Portland, OR) that could really use this since we lost our AAA team (we have A Ball and college ball but both suburban, and there's no ballpark). Of course now we're supposed to get MLB maybe. With spring training a month away, 17 teams are $75 million or more under the luxury tax threshold, including arbitration projections. Nine teams are $100 million or more under it.